Along came this other little pooch! 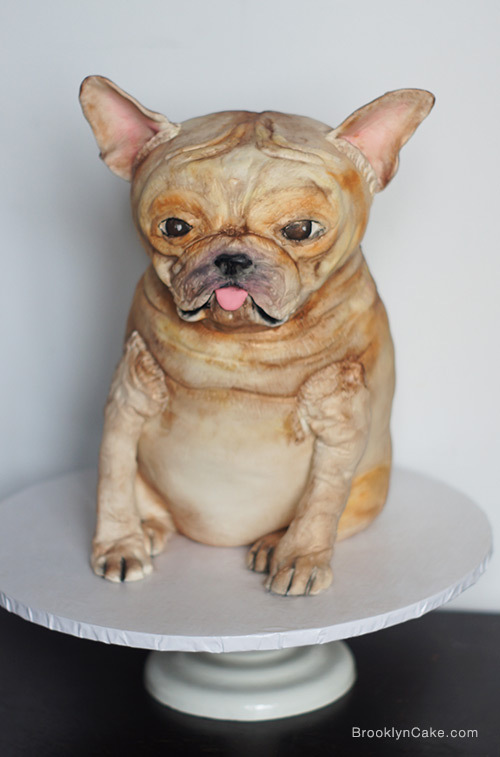 After spotting our cute little Shih Tzu online, we were approached to recreate a client’s dog as a cake for an upcoming party they were hosting. The big challenge was having never seen or met the dog in real life. While the client provided photos, it unfortunately, was not from the angles that would have suited our purposes. In the end, you have to use your imagination a little. While working through stages of this cake, there were a few times we were even startled by the realism of this French cutie. You half-expected the dog to pop right off the board and wag his tail. Needless to say, the cake was a huge hit with the clients’ guests. We were happy to have another satisfied customer. Check out our Shih Tzu Cake, the realistic detail on our Spa Diva Leopard Print Cake and the Storefront Cake. The design of your next cake can be as far as your imagination will take you. We are more than willing to take on the job!